Peacefully, with family by his side, at Hillsdale Terraces, on Sunday, December 7, 2014, at the age of 95. Beloved husband of the late Isabell Creamer (née Smith). Loving father of John (Judith) McConkey, Doug (Linda) Creamer, and Bill (Heather) Creamer. Devoted grandpa of Aidan (Stephanie), Jennifer (Steven), Jamie (Christine), Darryl (Stephanie), Laura (Chris), and Paul (Joanna). Cherished great-grandpa of Matt, Kaiden, Connor and Carley. Predeceased by his brothers Gord, Carl, Norm, Ron and sister Helen. Harold will be missed by many extended family and friends. Relatives and friends may call at McINTOSH-ANDERSON-KELLAM FUNERAL HOME LTD., 152 King Street East, Oshawa (905-433-5558) on Saturday, December 20, 2014 from 1:00 pm until time of service in the chapel at 2:00 pm. 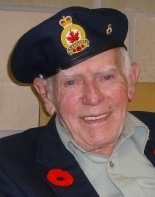 In lieu of flowers, donations made in memory of Harold to the War Amps of Canada or a charity of choice would be appreciated by his family. A special thank you to the Doctors, Nurses and Staff of Hillsdale Terraces, Ocean View 3rd Floor for their care and compassion. My condolences,,, May your memories give you peace and comfort. My sincere condolences to you and your family on the death of your father. Albert & I would like to express our condolences on the passing of Uncle Harold. He will truly be missed especially by myself as I remember the times we had as children coming over to your house to play and end up getting teased by John! Also, there have been times when I try to remember Dad's face and all I would need to do is look at a picture of Uncle Harold and all the memories would flood back. I remember the time at Mom's funeral when Uncle Harold brought out some pictures to show us of his and Aunt Isabel's recent trip where they had the priviledge of meeting Baywatch Star..David Hasselhoff. He was so tickled over that! He always had a funny story to tell! I think of you guys often, so keep in touch! Our love, hugs and prayers to all the family! Tom and I are deeply saddened by Uncle Harold's passing. I will always remember our many visits from Uncle Harold & Aunt Isabel. Uncle Harold always telling his stories and jokes making us laugh. They always made a point of seeing us at Christmas time. I couldn't believe how much he looked and reminded me of dad in the last few years. Used to make me smile. He loved the fact that Wally came to see dad and before he died he excepted the lord and Uncle Harold loved that. I will always remember Uncle Harold's famous pictures of him and the Baywatch beauties. That made me smile. He was such a special man and always my favourite uncle! I will truly miss him more than you know! Thinking of your family and praying for you all! Nicole and I are very sorry to hear of your dad's passing. We wish to express our sincere condolences to you and your families.